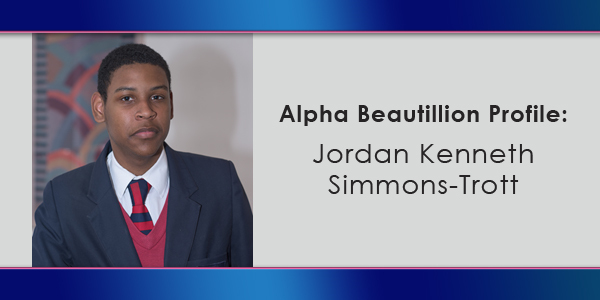 In the third in a series of profiles of the young men competing in this year’s Alpha Beautillion, we spotlight CedarBridge Academy student Jordan Kenneth Simmons-Trott. His profile, courtesy of the Alphas, says: “Jordan Kenneth Simmons-Trott is the first born to Kenneth [Kenny] Trott and Marie Simmons on April 4th, 1998. He has two sisters Jada and Mya Simmons-Trott. “From a very young age Jordan has always had a very loving, calm and gentle spirit. As a child, Jordan enjoyed doodling in his sketchpad, practicing his music and entertaining any one in his presence. Jordan spent his early years at Woodrose Nursery School, where he made friends easily and fell in love with his art lessons. “Later Jordan attended West Pembroke School and in primary one Jordan fell in love with writing. His teacher Mrs. Isaac encouraged him to write and draw as she recognized that he possessed a vivid imagination. Jordan’s love for words was quite evident in his writing, as his imagination would come to life through his choice of words. “Jordan would continue to work hard throughout primary school and in primary six he showed his firt signs of leadership when he served as a prefect. During his graduation Jordan gave the closing remarks where he delivered a first class speech, which earned him a standing ovation. “In 2009 Jordan went on to the Bermuda Institute for the middle school years. He continued on his path to success by remaining focused on his studies and holding the position as a prefect in grade 8. In the fall of 2012 Jordan moved to CedarBridge Academy. Jordan joined the Bermuda Youth Orchestra, where he continued to develop his musical skills. “Jordan stayed focused and worked on excellence until he was accepted into the National Honor Society. In S3 Jordan would became a prefect and placed in the top 10 students in his year level. Jordan is currently the Head Boy at CedarBridge, where he continues to sharpen his leadership qualities. “In addition he is also CedarBridge Academy’s Vice President of Education for Gavel Club, which began this year as a part of Toastmasters International. Jordan has spent a lot of time after school volunteering at the Victor Scott Primary School, Bermuda Underwater Exploration Institute, Aeries Nursery & Preschool and at CedarBridge Academy, where he tutors young males. “Jordan has devoted many hours with the young men helping them through many of life’s obstacles. Jordan was nominated in two categories for the Outstanding Teen Awards this year, Leadership and Spiritual Leadership. He was very proud to be awarded the male winner for the Spiritual Leadership category. “Jordan will be attending Mount Allison University in Canada, where he will be pursuing a Bachelor’s degree in English Literature and Fine Arts. He plans to continue his education and obtain a Master’s and Doctorate Degree to offer him the opportunity to return home to become a Professor at our fine institute of higher education, The Bermuda College. The Alpha Beautillion is a “Rite of Passage” Ceremony where top high school male students demonstrate their oratorical ability, talent, and community service activities as they compete for scholarships, with a bursary prize of $5,000 is awarded to the top male and smaller monetary awards given to all other participants. 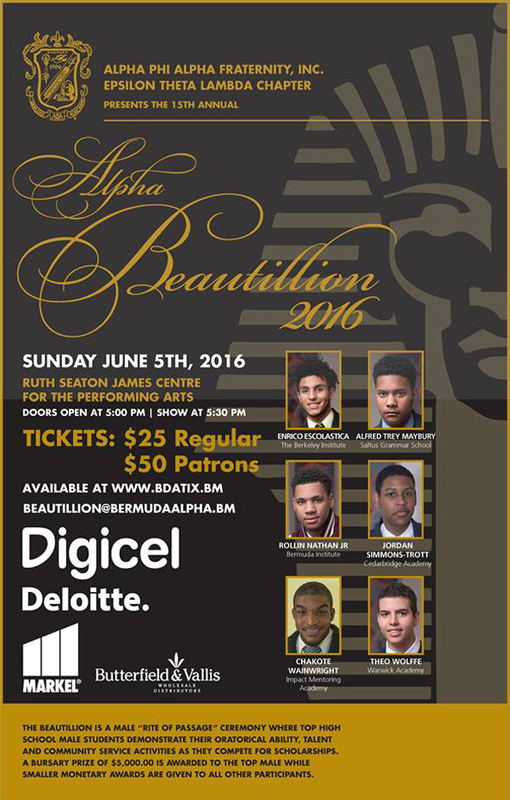 The 15th Annual Alpha Beautillion will be held on Sunday June 5th at the Ruth Seaton James Auditorium, with regular tickets costing $25 and patron tickets costing $50. What a lovely bio of this fine young male. It give me great hope to know that Bermuda will be in great hands in the future. I wish him and all the other young males all the best. Go Cedar Bridge Academy!